Cleaning and caring for glass is something most of us know how to do and take for granted. But caring for a glass straw, on the other hand, might just catch a few of us off guard. “How do you clean a glass straw?” is a very common question customers ask us in person. Few are taught how to clean straws, but it’s not as hard as you think. 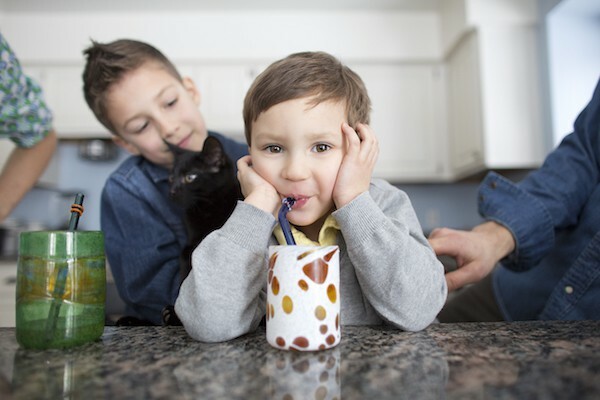 Unlike some delicate glassware, our glass straws can be washed and sanitized in the dishwasher. 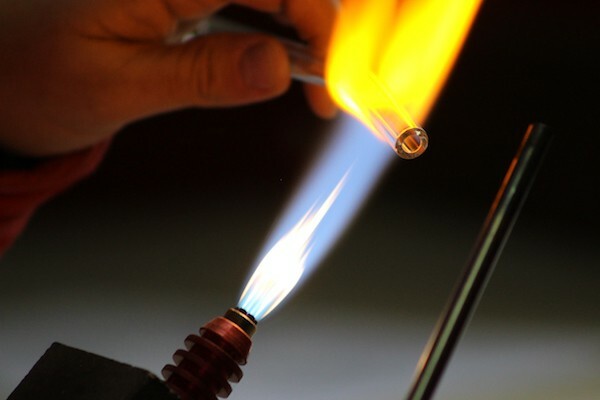 We use the strongest available commercial glass to make our straws. They are very durable as well as heat safe (up to 1500 degrees Fahrenheit!). This makes the dishwasher the top choice for cleaning glass straws. 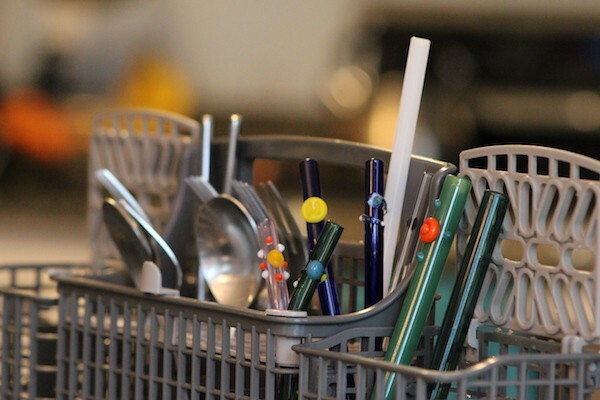 We recommend dedicating a utensil section to your glass straws (as shown in the photo above) so that any metal utensils will keep their distance from your straws and reduce the likelihood of possible damage. In our experience, damage of this nature has never happened, but we take the precaution anyways. For those of you that do not have a dishwasher (in other words you are the dishwasher! ), we have a custom USA made, rust-free stainless steel straw cleaning brush that when combined with soap and hot water, does an effective job as well. The 8″ straw cleaning brush works on any length straw that we carry in regular and larger widths. If you are a smoothie person and do not rinse your straw out shortly after use, you may want to have a straw cleaning brush on hand as well. Sometimes those thick smoothies like to cling on for dear life. If your glass straw ever gets cloudy from hard water conditions, soak it in distilled white vinegar to return the glass to its original beauty. 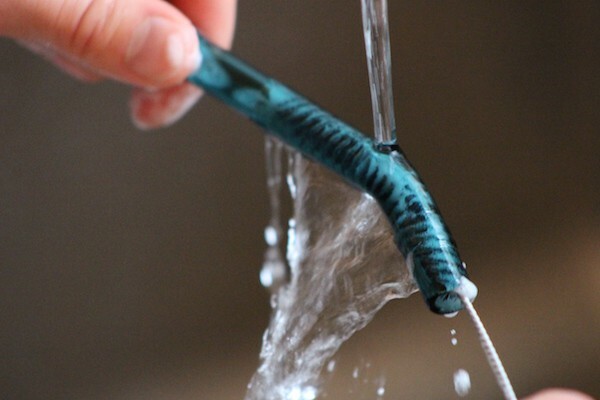 Use a straw cleaning brush after a short soaking to speed the results. 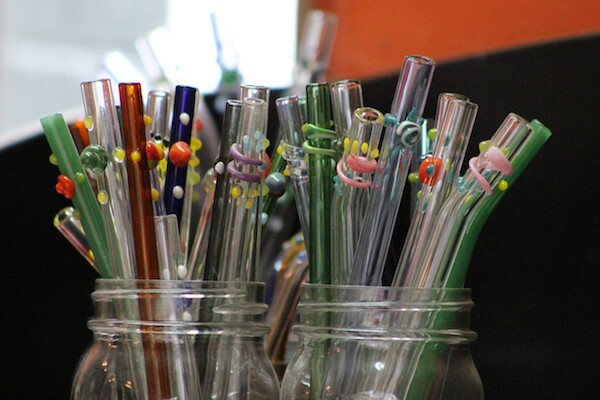 Once you’ve acquired a few Strawesome glass straws and begin to build your collection, you will start to consider the best way to store glass straws at home. The first thing to keep in mind is to treat your straw like any other glassware item in your home. While they may not be as delicate as crystal glassware, glass straws can break if hit against a hard object or dropped on stone, ceramic tile or cement. If you put them in a drawer, make sure that they will not be disturbed by other items in the drawer. Since we love the artistic nature of our glass straws, our favorite method of storing our straws is out in the open to show them off! Mason jars of varying sizes work great. You can even store your straw cleaning brush in the same jar. The photo above shows how we display the samples of designer straws we make in our workshop. When our friends and family visit, it’s great to strike up a conversation about our business and product when asked what is in those jars on the counter. It reminds us daily of our mission to rid the world of single-use plastics and fill it with artistic, functional art. It feels good to do something that makes a difference and displaying your glass straws on on the counter is a great reminder. Under normal use, your straw will last a long time and become an enjoyable beverage accessory. If you ever notice any chipping, cracking or breakage, stop using the straw immediately and request a replacement straw. Our product is something we stand behind, and even though only a small percentage of straws break every year, it feels great as a customer knowing we’ve got you covered.